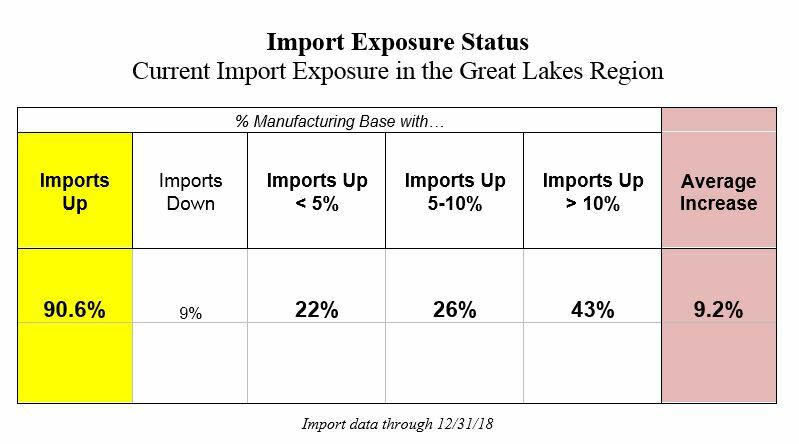 Current Import Exposure is Very High – GLTAAC estimates that 91% of Great Lakes manufacturers are presently facing rising imports, and that manufacturing imports are up by an average of 9.2% in the region. For information about import exposure, see our blog. For an explanation of the numbers in the table, see here. This graph is a compilation of import exposure over time. The vertical axis indicates the percentage of all tri-state manufacturing establishments that are in industries facing year-over-year increases in imports. The horizontal axis is time; data are monthly. The colors indicate the intensity of import competition, and the areas are additive. Thus, looking at the first data point (at the far left of the graph, reading from the bottom up) – it indicates that 74% of all Great Lakes manufacturing establishments were in industries that had experienced at least a 10% increase in imports for the 12 months ending January 2011 compared to the 12 months ending January 2010. 7% were in industries where imports had increased by 5-10% (meaning that 74% + 7% = 81% were in industries where imports increased by at least 5%. Note that the second line from the bottom hits the vertical axis at 74 +7 = 81%). And 3% of all Indiana-Michigan-Ohio manufacturing establishments were in industries where imports increased by less than 5% for the year-over-year period ending with January 2011. The graph thus presents this import data for each year-over-year period ending every month from January 2011 through December 2018. In so doing, it depicts the breadth of import impact (illustrated by the total height of the area graph), as well as its depth or intensity (indicated by height of the individual lines at any single point in time). 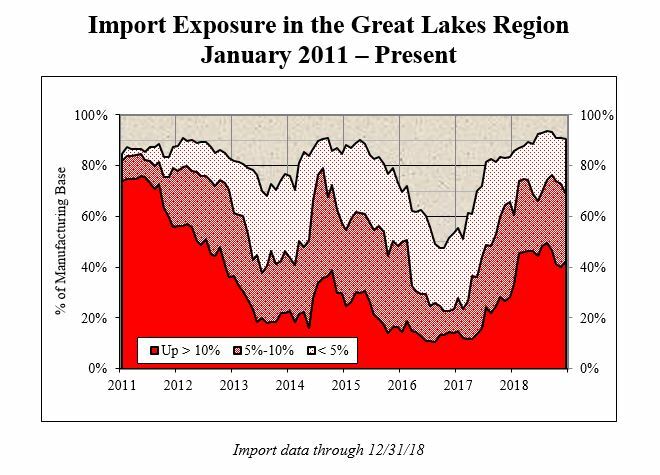 Further, understanding that most of the effects of foreign competition on businesses compound over time, the amount of red in the graph can also be thought of as representing the cumulative pressure of imports on the entire Great Lakes manufacturing sector over the past 8 years.